The ISO files are most commonly used to distribute very large programs over the internet as it can contain all the program files into a single file very neatly. The burning process of the ISO files is different than burning audio, video or other files to the disc. To do this, you will need the best ISO burning software. As the files must be assembled first it is a time-consuming process for the inbuilt softwares of the computer. Thus, whether you have a Windows OS or Mac, burning the file to data disc can be done with some free ISO burning software easily. 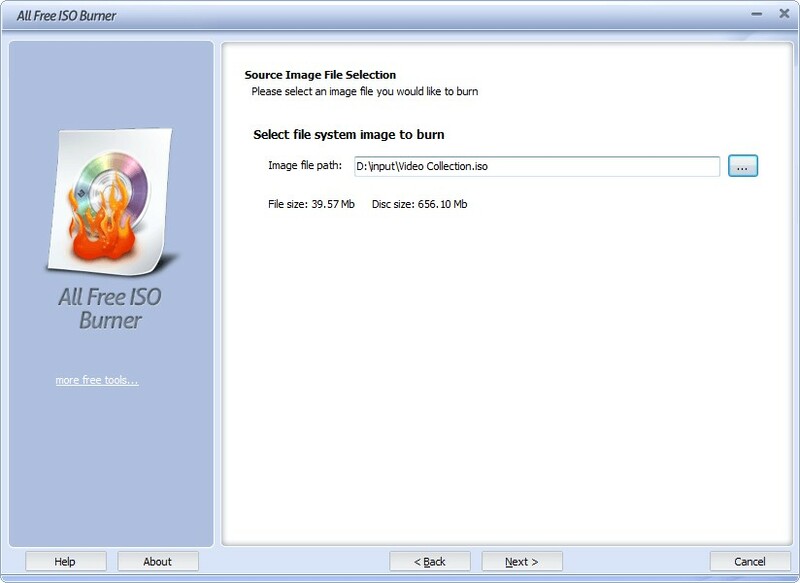 In the article, we are going to discuss which software is the best to burn the ISO files without any hassle. For the Windows OS, we have the free ISO image burner that is very popular nowadays. It is the Wondershare DVD Creator that has been the most reliable and powerful tool that can easily burn ISO to DVD and other data disc. Step 1. 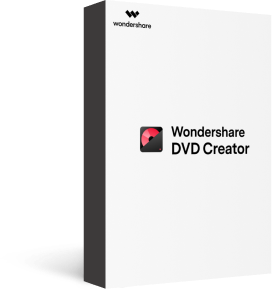 Download the Wondershare DVD Creator software from their website and install it on your computer. 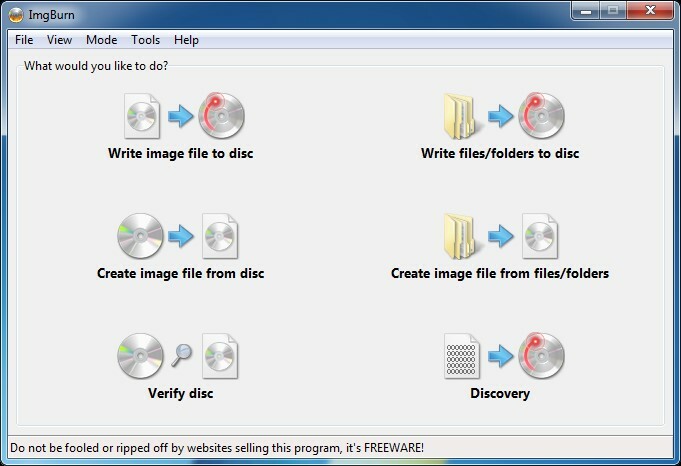 Then launch the software and click on the More DVD tools from the software’s interface. Step 2. In the next screen, you will see the option which says ISO to DVD. Tap on it and you will b navigated to the next page. Step 3. Now, choose the file that you want to burn to the DVD and also select the burner that you wish to use. Step 4. Once you have successfully added the files and decided the Burner, tap on the Burn option and initiate the burning process. Step 5. 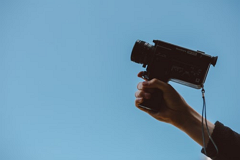 When the process completes, you will get notified and the software will provide you an option which will allow you to burn the same ISO file to another DVD. 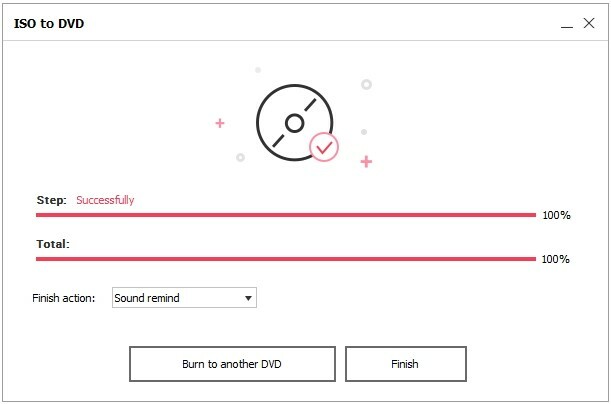 If you want to do it then tap on the option otherwise click on the Finish button and you will able to eject your DVD from the Drive. 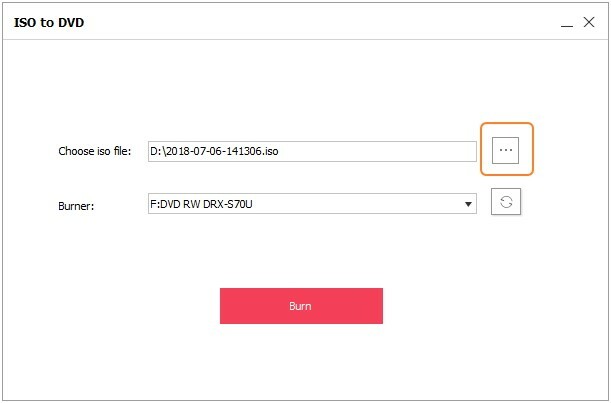 So, now you know how you can burn the ISO file to DVD with the simplest software which has the functionality of all the popular softwares combined. Apart from the Wondershare DVD Creator, there is much other software present on the internet which is free and allows the users to burn the ISO file to DVD. So, now, we will discuss other 12 free ISO image burner and will compare them to the Wondershare DVD Creator to decide which the best software is. The other softwares are listed below . 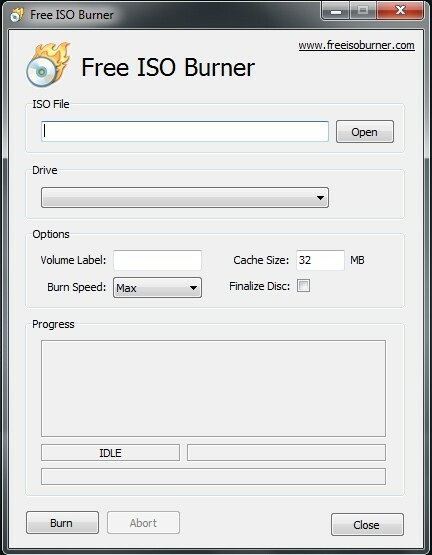 The free ISO Burner is the software which directly burns the ISO, CD, DVD files to CD-R, CD-RW, DVD-R, and other discs. The best thing about using this software is that it hides all the complexities of the software behind a single easy interface and allows the users to burn a file with few simple steps. It is portable software and hence you can delete it from your system anytime and can install it in the time of need. The users are free to select the drivers and can take advantage of plenty of customization features. Users can set the disk volume, burn speed and can also change the burn cache size. The burning process can also be aborted in between the operation. The format support is also good. The files that can be burned with the help of this software include simple data and music files. It is completely free and hence can be used for non-commercial and personal use. There is no extra requirement for the software. It doesn’t need installation as it is a program file which can be run whenever you want to use it. •	It is available for Windows, Mac, and Unix-like system. •	It doesn’t even need a virtual drive to emulate the physical CDs or DVDs. •	The program file can be mistaken for some extra file and deleted by mistake. •	A commercial version is not available. •	Many features are hidden in the software. 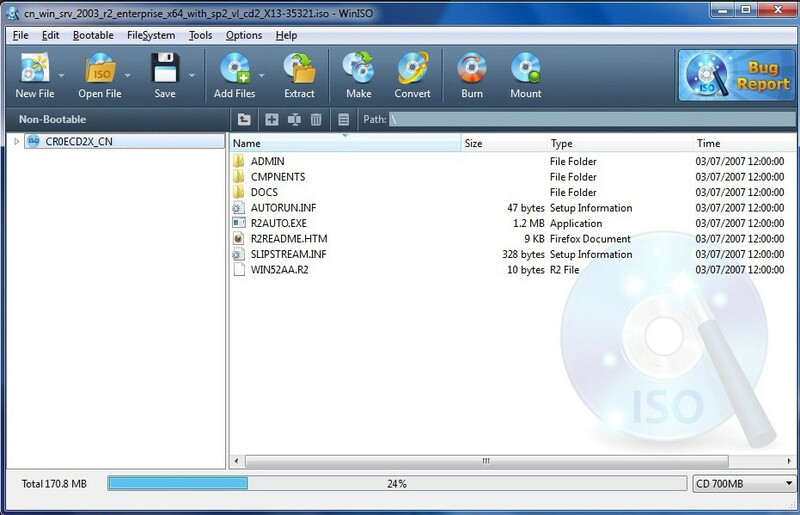 The Active@ ISO Burner is the free ISO image burner that has a simple to use the software in a dialog-style. It can easily burn CD/DVD and Blu-ray ISO images which are compatible with the ISO 9660 Standards. The software has three modes for burning including SPTI, ASPI, and SPTD which works under the user account. All the information regarding the extended device, media files, and the ISO file is displayed on the software’s interface. There are multiple burning modes available that can copy a number of files. You will be able to see the complete report of the burning process and text log will also be displayed including the actions performed, progress and errors in the process. The wide array of disc support makes the software a very popular choice for the users. The afterburn actions also have a configuration like Verification, eject the disc, and shut down the PC. The users can also create multiple copies of the same file on the same disc to have a backup of the files. •	The software supports automated burning. •	Provides all the information on the disc and files which are getting burned. •	Comes with a variety of burning options. • The features are bundled up too closely which makes them hard to specify. • The automated burning sometimes results in data loss. The PowerISO is the free ISO burner for Mac that is very powerful and has a variety of features. As the name already specifies it comes with a lot of superb features which is why the software is preferred by the users. It is a simple and advanced image processing tool which can also perform extraction and edition of the data files. It is termed as the all in one solution to mount the ISO files with a virtual drive. The file format supported by the software includes CD/DVD, BD-ROM disc formats such as ISO, BIN, CDI, DAA, NRG, and etc. The software allows the users to create, compress, encrypt and split the files within the interface. It can also be sued to create a bootable CD, DVD disc that can be sued on multiple platforms. The software consists of quite an easy interface that makes it really easy to use. It also supports shell integration, drag and drops feature, context menu, clipboard copy paste, and many more features. •	The software can also be used to rip media files. •	The ISO files can be edited within the software. •	The Windows support is vast. • Not available for Mac OS. • Some features are only available for the Premium version of the software. 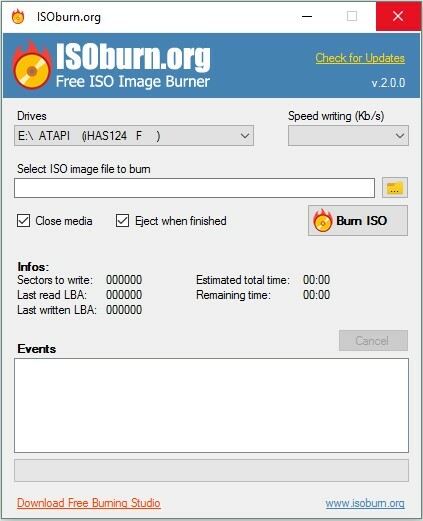 The ImgBurn is the ISO burner free for download and has plenty of advanced features. It is software which is lightweight burning application and can perform burning of CD, DVD, Blu-ray disc and HD DVD. There are various modes available in the interface which includes read, write, built, verify and discovery. All these tasks can be performed directly with the help of software and then the ISO file can be burned on the data disc with simple steps. The format support of the software is also vast and includes BIN, CDI, DI, CUE, CCD, DVD, GI, IMG, ISO, NRG and many more. Other than image file formats, it also supports audio and video file formats that can be burned using the software. Although the software consists of many advanced features that might be lacking in other softwares on the list that also make the software more complex to be used by beginners or nontechnical users. The software is regularly updated and hence the bugs and errors are frequently removed from the software to provide more enhanced software for the users. •	It has a special layer break selection screen which supports double-layer DVD jobs. •	The software has Windows and Linux support. •	Not supported by Mac OS. • The configuration is very typical that makes it hard to understand for many users. The WinISO as the name already signifies is a Windows-free ISO burner which is a professional utility tool. 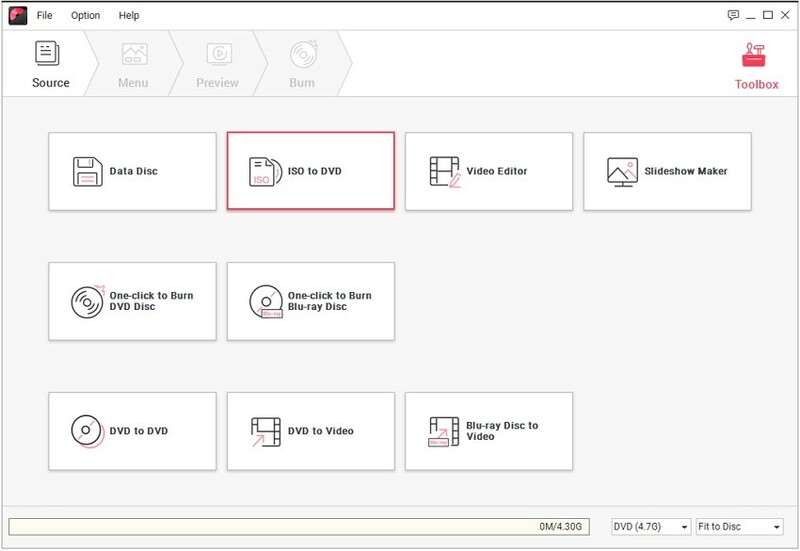 The users will be able to open, create, edit, convert, mount and extract the ISO files to other formats with few simple steps. It consists of an ISO editor, Extractor, converter, burner and ISO mount tool. The speed and file support of the software is appreciable but not consistent. The software is also capable of making a bootable disc. It can also process the CD, DVD, and BD image files. You will be free to use the ISO editor to add and open files and rename them. After performing the entire editing, you will be able to run the file same as before without any difficulty. 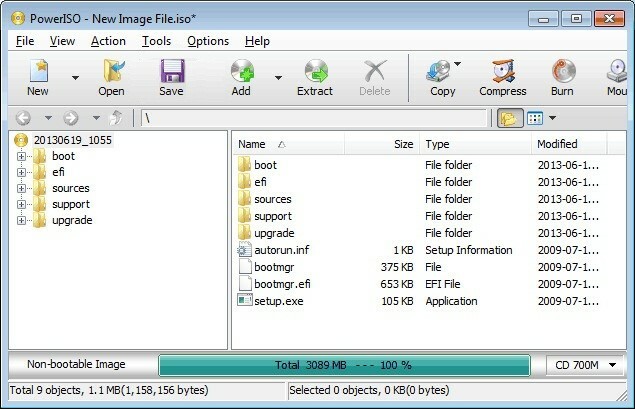 The image format support includes BIN, CUE, ISO, MDS, NRG, CCD and some other. The formats can be easily interchanged with any data loss. The software has a separate Bootable ISO maker that save bootable information to img or bif file that can be imported to data disc easily. •	It is a comprehensive solution for the ISO burning requirements. •	The software has a complete technical support system. • The free version only has limited features. The ISOburn is the best ISO software that can be used directly to write the ISO image file to any type of data disc. The software also has a feature that helps the users to create a bootable image file. It consists of some basic customization for the burning process. This is an easy to use tool which is designed only for the basic burning operations. This Audio DVD burner is free to download but still perform all the functions hassle free. It can create an integrated audio CD or DVD and could even do it in layers. it can also rip the audio CDs along with other kinds of CDs and DVDs too. Although many features are added to the software, still the UI is kept as simple as possible. •	The does not include any spyware or adware. •	The software requires.Net Framework 4+ to work efficiently. •	It is not portable. 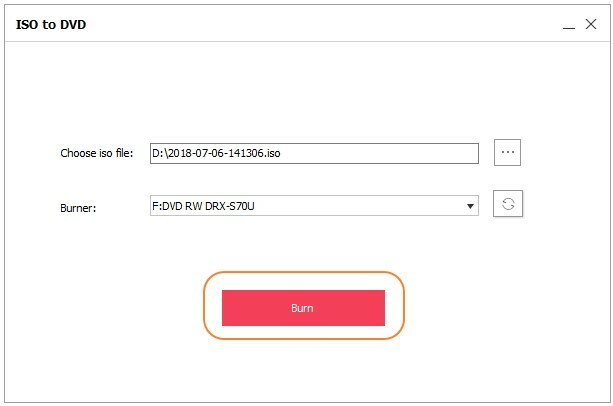 The CDBurnerXP is the best free ISO burner application that has many features and can burn file son multiple kinds of discs. It can be used to create and burn ISO files and it is available for commercial and non-commercial use for free. It can also burn the audio CDs without leaving out any gap between the tracks. •	The software interface has Multilanguage support. •	The software has a complete form and guide to ease up the process of understanding the software. •	The data verification process takes a lot of time which delays the burning completion. •	Doesn’t have that much-advanced feature. 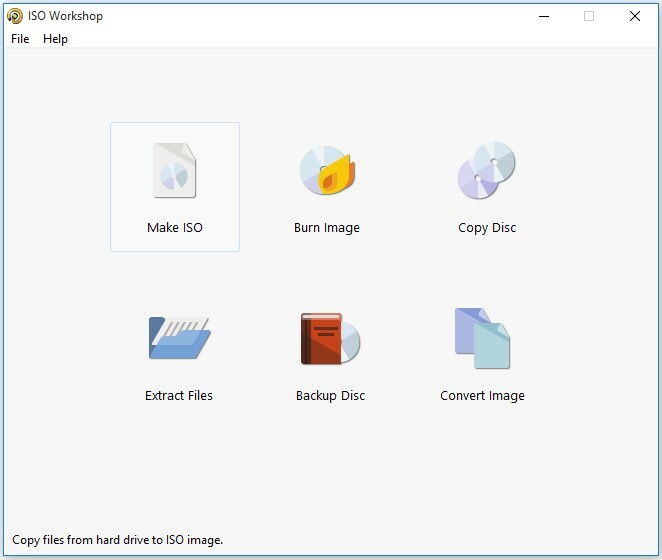 The ISO Workshop is a free ISO burner desktop application which is specially designed for ISO image conversion and management. Rather than that, it can also perform the burning and copying operations. The software has a very smart and intuitive interface which enables the users to make ISO images and extract files from disc images. •	The software can easily create disc backups and perform conversion easily. •	It can also copy the original data files into data disc. •	There are certain bugs and errors in the software which results in data loss and quality loss. •	Don’t have other OS support. The BurnCDCC is the software which is handy and a part of software utilities with subcategories. It is termed as the best ISO burner because of the simple catalog features. The software doesn’t require much space on the system and is very easy to install and use. •	The software is completely free and doesn’t require any additional program support. •	It is a very light program that does not require large storage. •	Doesn’t have advanced features of burning software. 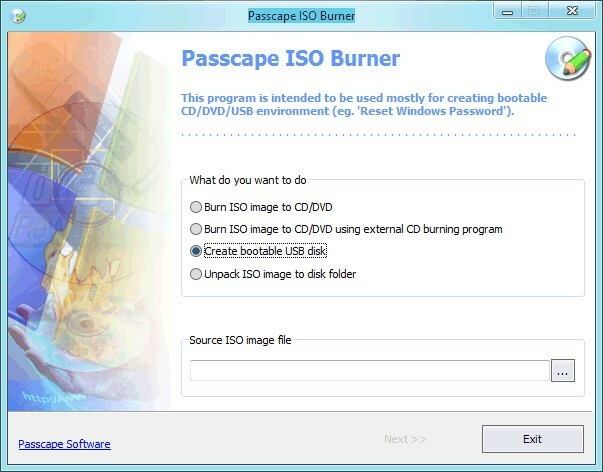 The Passcape is the best free ISO burner that was developed to perform the operation of creating a bootable disc from ISO images. Then many features were added after so increase the functionality of the software. It has support for the partition schemes too and can also extract ISO images to any disk. •	The software works even if no CD or DVD is installed on the system. •	It works out of the box and hence no installation is required. •	The software requires some modification in the basic settings of the system. •	Administrative privileges are also required to allow some features to run properly. The All Free ISO Burner is the software which has the similar features to Wondershare DVD creator but lacks in many advanced features that are provided in the Wondershare. It can be the best ISO burner for the users looking for a basic tool with the high-speed process. It can burn the data files to ISO file and then can burn it to any data disc. •	A special error detection mode is provided to avoid errors. •	Multiple file format support. •	The system capabilities affect the working of the software. 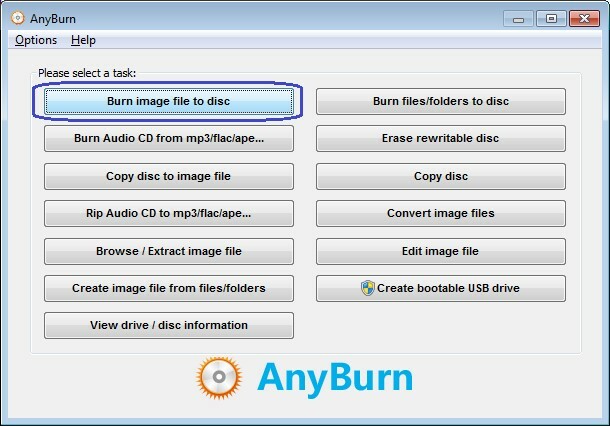 The AnyBurn software is Windows free ISO burner, which can additional rip files from the data disc. It can easily convert and create disc image files and also support multiple types of data including audio files. The software is lightweight but can perform heavy file burning easily. •	The software also has Linux support. •	The data disk support is limited. Choosing the best software among a big list of similar softwares is very hard. It is only by comparing their features; we can make a decision that which one is really effective and reliable. So, here we are going to compare some important key features that must be present in the software. Have a look at the comparison table to decide which is the best free ISO burner and give it a try. Clear interface Not clear but very smart Hard to understand Clear interface Very advanced but complex Easy interface Simple and clear interface Simple interface Very intuitive Very simple interface The very simple user interface Simple and clear interface Clear interface with advanced features The simplest and advanced interface. Now, as you have seen from the above comparison table, it is pretty clear that the features that are absent from all the other software are all present in just one Wondershare DVD Creator which makes it the best ISO burner for Windows and Mac. 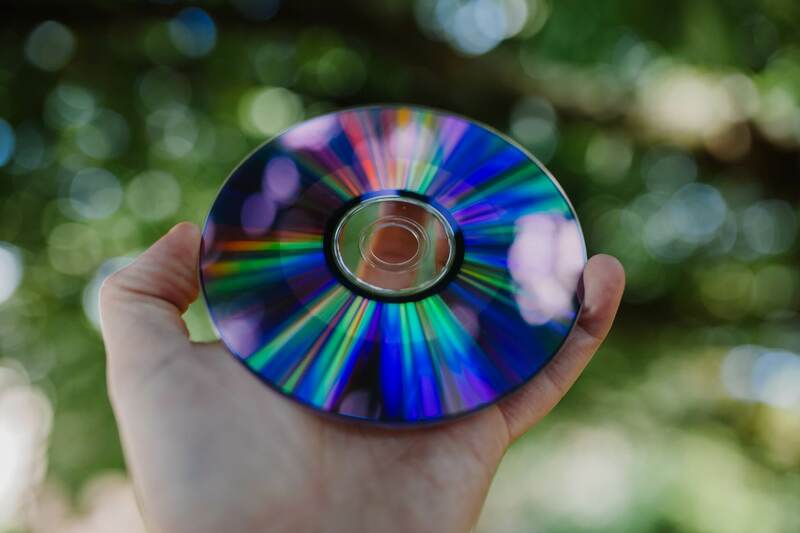 So, instead of relying on any other software, choose the Wondershare DVD Creator to burn the ISO image to data disc and other files too with fast speed and original quality.